Continuity mistake: In the scene where Trevor Howard and José Ferrer are sharing what appears to be some port (about 50 minutes into the movie), the port decanter has a drip stopper in the long shot which disappears in the close-up shot of Leslie Howard and then re-appears in the following longer shot. Factual error: The Military Police on the train have Royal Military Police shoulder flashes. The Military Police did not become "Royal" until 1946. 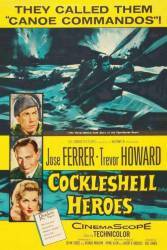 Factual error: Towards the end of the film, the German troops are searching for the marines and cross from the dockside to lighters and then on to a harbour launch. Although this is supposed to be in Bordeaux the launch is marked 'PLA' or Port of London Authority where the action must have been shot. Captain Thompson: Keep the line straight, Boys.